I bought The Geek’s Guide to Unrequited Love last year while working on my own novel for NaNoWriMo. As someone who loves conventions, cosplay, and geek/nerd life in general, I knew that I would love this book as soon as I read the summary. The “geek” in question from the title of the book is sixteen year old Graham William Posner, “lanky, pale, glasses, with a penchant for fantasy worlds.” He has a crush on his best friend, Roxy and hopes that going to New York Comic Con with her would provide him with the opportunity for him to confess his feelings, especially when one of the guests at NYCC is Robert Zinc, a reclusive comic book writer who is stepping out of the shadows for the first time in forever. Of course, things don’t go the way Graham hopes, especially when Roxy hits it off with a guy she meets at the con. As Graham tries to get the best NYCC experience possible and impress Roxy in the process, the reader is treated to a very genuine perspective of what it’s like to be at a con: the costumes, the merch, the panels, and all the unique events that fans get to go to. All the while, Graham continually fails at impressing Roxy and eventually learns that his feelings are unrequited. What makes this book work is that you really root for Graham and he never acts like he’s entitled to Roxy’s love. He gets jealous of the new guy, but he eventually learns that it’s okay to not get the girl. The book may not end with the conventional happily ever after, but I still love it because by the time the story ends, you see how much Graham has matured and his desires change towards things bigger than just getting the girl. I recommend this book to all my nerdy friends and to people who can learn a thing or two about being in love. We’ve all experienced unrequited love and this book shows how people can deal with it in a healthy way without friendships taking collateral damage. It’s refreshing to find a story that focuses more on selfless love and friendship rather than the tired love triangles and “pretty people problems” you see in every other YA novel. May was a majorly awesome month for many things, but one thing stands out even now: Comicpalooza. 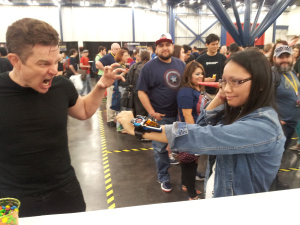 This picture will forever be my favorite picture from Comicpalooza. The only thing I regret was not holding my right arm high enough so the stake could really be seen in the picture. This is one of those pictures that is actually worth a thousand words. The last time I went to a convention was in college for anime-related cons. I went with friends, but only met two actors I liked, but didn’t love. I didn’t want to read the comic books because I felt they didn’t fit what I wanted to happen after everything ended and Angel was too depressing for me to deal with. This convention was me getting out of that slump and remembering why I love Buffy so much: I felt like I was part of the Buffyverse and meeting James Marsters, Clare Kramer, Nicholas Brendon, James Leary, and George Hertzberg only made it all the more real. The catharsis I experienced when I started watching Buffy found completion upon meeting these actors. I went to Comicpalooza with a friend who wanted to meet the Power Rangers actors and that was just as cool. I actually felt conflicted for a bit when I found out that the Buffy panel took place at the same time as the Power Rangers panel…but once I made my choice, I had no regrets. I honestly can’t wait until I can go to another convention just to see these actors again because I can honestly say that being a part of the Buffy fandom was one of the best things to ever happen to me. Comicpalooza. Nope, I Still Can’t Believe It! So yesterday was awesome. As you can tell from the title, I went to a convention. It was the first time I’ve been to a con since college and the first time I went to a con as huge as Comicpalooza. Cons are one of the few places where I can say it’s safe to talk to strangers. I wasn’t sure what line I was supposed to be in going in. The first thing I went to was the weapons check since I was cosplaying Buffy, stake and all. The people at the weapons check told me which line to go into. As I was in line for those who pre-registered, I talked to a guy who cosplayed as Indiana Jones. He was a con veteran and he gave me some advice about how to go about cons as huge as Comicpalooza. After getting my pass (a red bracelet since I only paid for a one-day ticket), I went straight to the autograph area to get in line for one particular Buffy actor: James Marsters, the man who played Spike. I found one other Buffy cosplayer. Most of the people in Comicpalooza dressed as something Doctor Who related, Firefly, Doctor Horrible, Marvel…but not a single vampire to be found. But who the heck wants a Spike cosplayer when I got to pretend to stake the real deal? I told him that I was going to the Buffy panel and he told me (and later everyone else at the Buffy panel) to ask him the most embarrassing question we can think of. There is a word for a man like that, but that word might make this blog NSFW! Just take my word for it, James Marsters is seriously self-assured. After getting my picture taken with James Marsters, I convinced my friend to get a photo with one of his favorite actors. A good handful of actors from Power Rangers were there and my friend had my eye on one particular actor. Since I was Buffy, I basically told him “Seize the Day!” My friend did so and was forever grateful for my encouragement. My friend and I headed straight to the Buffy Panel, taking some pictures along the way. It was so awesome seeing Xander, Glory, Clem, Adam, and Spike! I was bouncing and screaming and I was pretty sure I was embarrassing myself, but hey, I’m at a con! Where else can I get away with it? I had two questions for the cast. I asked Nicholas Brendon if he knew about the schwarma line in Avengers and how that line was inspired by something he said on the set of Buffy. Nicholas said that he did hear about it and that he hasn’t watched Avengers yet. But apparently Robert Downey Jr stole the credit for coming up with the line. My second question was for James Marsters. I asked him something along the lines of “So did you have to work to get into the character of Spike or did it just come naturally?” His answer was something along the lines of “A bit of both and it’s kind of embarrassing to think about it.” That’s right. I met the challenge he asked the entire audience! This bouncy, crazy, slightly autistic girl managed to embarrass her favorite celebrity in the best way possible! After that, my friend and I debated on whether or not we should go to the Agents of SHIELD panel. The line was a mile long and we were getting hungry. I was basically set on just shopping in the Dealer’s Room for the rest of the day, so we went to get lunch. After lunch, my friend and I got drafted into playing Quidditch. I played the position of Beater. It was actually pretty fun even though I had no idea how to play. I spent the rest of the con shopping in the Dealer’s Room and star-gazing at the celebrities in the autograph area. I got a gift for my brother and an art commission for myself. By the time I was ready to go home, I was lying down in a sitting area, exhausted in the best way possible. So yeah. Conventions. Definitely one of those once-in-a-lifetime experiences! I highly recommend going and going all out! Cosplay! Meet your favorite celebs and get some seriously awesome merchandise.